Having a working water heater is essential to running a home. 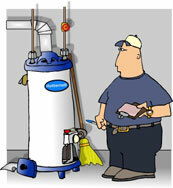 When your water heater isn't functioning properly, it can throw a big wrench into your daily routine and schedule. That's why our professionals are available from 7am to 6pm Monday through Friday and 7am to 4pm on Saturday. Closed Sundays. There are many different types of water heaters you can employ including those with and without a storage tank, as well as gas and electric models. The cost for energy used heating your home is the biggest part of your energy bill, so it is important that you select a water heating system that works for you and your family. In response to rising energy costs and in accordance with the "green" movement, more and more people are switching to tankless water heaters which heat water on demand in lieu of having a traditional water heating tank. 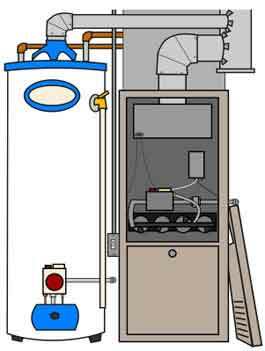 When it comes to tankless water heaters we can help you select the size and model that it right for your home. Additionally, we are happy to help with the maintenance of water heaters by performing a pre-season or annual check up to make sure all systems are running properly before a problem arises. Keep your home happy and warm by giving us a call!